CM’s pitcher Ronzoni Hacker started out hot delivering a first pitch strike to the first four batters. He even got Cam Rainwatwer to strike out for the game’s first “Cold Beer K,” but two costly errors led to a 2-0 deficit. CM had no answer and went down 1-2-3 to start the game. Jus Archer drove in Matt “Ajax” Anderson to make it 3-1. Angel Shannon quickly cut the lead to one with a two run blast to right field. Ajax got “12 Pack” Jack Livesey to foul out to end the inning. Ronzoni fell out of form and walked two consecutive batters which led to two runs and a 5-2 deficit. Bret Regimabald had a nice looking sac in the fourth and Judd “Magnum” Washburn drove in a run too to cut the lead to one again 5-4. 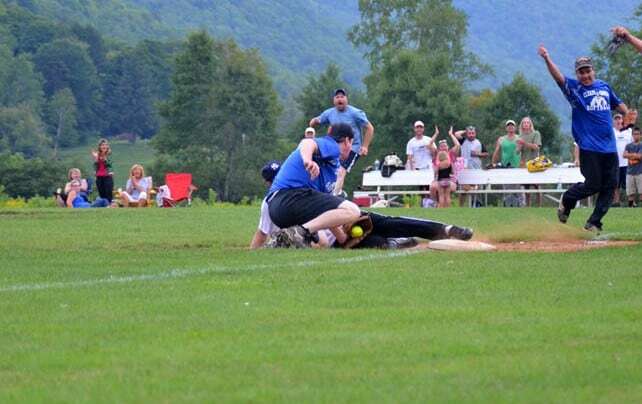 Just like last year The Killington Deli Team took game one. CM jumped out to a 2-0 first inning lead in game two after Washburn drove in Burdick and Regimbald. TKDT showed that they came to play and were not phased at they put three on the board for a 3-2 lead. Both teams went scoreless in the second. Shannon continued his MVP bid with a three run dinger in the third to regain the lead 5-3. TKDT put runners on first and third but some good “D” kept them there. Both tams went down 1-2-3 n the fourth with some notable outs each. 12 Pack Jack suffered another “CBK” and Dave “Loco” Concepcion got thrown out at second from Shannon in right field. 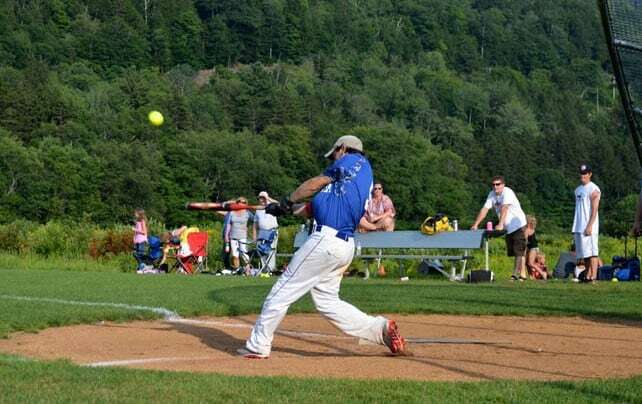 Keith “Bubba” Lazarczyk fired up his team and himself when he led off the fifth with an inside-the-park home run. His first of the season and it was with his Dad in the stands. Regimbald used that intensity and fired off a deep bomb to right for a two run home run and an 8-3 lead. TKDT loaded the bases but a couple fly outs and a costly “CBK” by Coach Craig Brothers ended that chance. Shannon scored in the sixth to make it 9-3 and TKDT went down 1-2-3 to keep it that way. Everything was going right for CM and TKDT lost their momentum and some motor skills along the way as they could not get anything going. With already an insurmountable lead, CM put up five in the seventh to make it a laughable 13-3 lead. Bubba jacked one to left and the “Drop Craig Murphy’s” came out to play as Brothers missed it off his glove. Everyone was getting in the home run game, well except for TKDT, and Burdick blasts one to center for a two run shot. Jimbo Cassineri scored in the last half inning but that was all she wrote and CM tied the series at one a piece with a 13-4 win. Brothers scored in the first inning of game three to give TKDT a 1-0 lead. TKDT’s Dan Muller gave CM some bulletin board material with a Facebook message saying that Shannon and Burdick better come to play or CM has no chance. Well Burdick scored in the first and Shannon had a nice looking sac to give CM a 3-1 lead. Cassineri scored in the second to cut the lead to one. CM answered that in a big way. Tall Tom Gilligan was having an awful series going 0-7 with a game ending “CBK” on Monday. If anyone needed to turn it around, it was him. He jacked the biggest home run of the season, a shot to deep center, and it was his first of the season. Evan Anderson made a play for it but crashed through the fence trying. CM went crazy a that happened. Brando Remick stayed hot with a nice looking sac to make it 6-2. Ronzoni delivered a big “CBK” in the third to Brothers as he watched just the tip go in on the plate and he went down looking. Shannon got that “HR Power” that Muller was referring to and sent one flying for two runs in the third and an 8-2 lead. Chris Alf drove in Evan Anderson in the fourth to get a run back. CM failed to answer in the bottom of the fourth to have their first scoreless inning and one of those outs was a “CBK” looking by Jared “Looking Ahead to Fantasy Football” Hall. CM had some outstanding “D” in the fifth when Burdick made a diving bobbling catch and Hunter Pike turned an inning ending double-play on Brothers. Archer was able to score to cut the lead 8-4. Ronzoni got that run back as he scored 9-4. CM had the bases loaded but Shannon flew out to end the inning. Things got crazy in the sixth. TKDT put four runs on the board to put a scare in CM and cut the deficit to one 9-8. CM thought they played some good “D” and threw out two men at third but Umpire Leslie Nielsen saw it differently. Things were intense with near ejections happening too frequently. CM was able to stop the madness and stop the rally one run short. This really fired up Jackie Blue as he came to bench and completely flipped it over, almost maiming a little kid. Luckily no one was hurt and Bubba used that intensity for a lead-off triple. Jack fired himself up and got a nice looking sac to bring in Bubba. 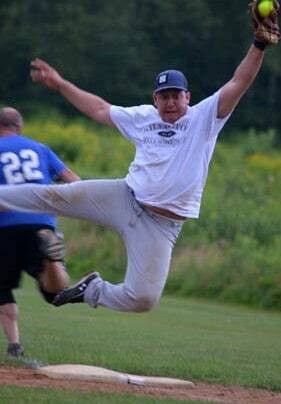 Tall Tom then shot the ball as if it came out of a cannon for the biggest home run the league has seen to make it 11-8. Ian Waye was able to get on base in the seventh but nobody else was and Brothers flew out to Regimbald to end the series and the season. “Clearly” Moguls did what they do best and that’s mount comebacks and win championships. This marked CM’s fourth Championship win in five tries and their second time going back-to-back. Shannon won the championship series MVP and Gilligan the game MVP. Look for more awards next week.